U.S. President Barack Obama (R) is welcome by Laos President Bounnhang Vorachith at the Presidential Palace in Vientiane, Laos, September 6, 2016. 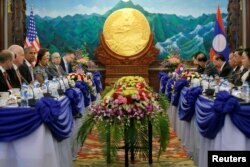 The White House said Tuesday the United States and Laos have opened a new era in their relations based on mutual respect and "a shared desire to heal the wounds of the past." An announcement of a new partnership on issues of the economy, technology, education, security, the environment and human rights followed a meeting between Presidents Barack Obama and Bounnhang Vorachit in Vientiane. Obama is the first sitting U.S. president to visit Laos, and announced Tuesday a three-year, $90 million contribution to Laos for a national survey of unexploded ordnance and efforts to clear the bombs dropped by U.S. forces in the 1960s and 1970s. About one-third of the 2.2 million bombs dropped on Laos remain undenotated and the lingering threat has slowed development in the country. U.S. President Barack Obama (3rd L) sits down to a bilateral meeting with Laos President Bounnhang Vorachith (3rd R), ahead of the ASEAN Summit, at the Presidential Palace in Vientiane, Laos, September 6, 2016. The White House said Obama expressed his appreciation for the cooperation of Laos in working to account for U.S. personnel who went missing during the war. Obama is seeking to reassure nations in Southeast Asia that the U.S. is firmly committed to its rebalance to the region. He will seek to further deepen ties and boost America's influence in the region as he attends the ASEAN summit and the East Asia summit this week. “He'll talk about how far we've come in shaping an architecture in the Asia Pacific for the United States to lead and to be at the table in forums like ASEAN and the East Asia Summit,” said Ben Rhodes, deputy national security adviser. Obama will credit his policy with increased commercial, economic and security ties and for more partnerships in the region to deal with sensitive issues like maritime security. During the speech, the U.S. leader will also make his case for ratification of the Trans-Pacific Partnership (TPP), a massive trade deal facing intense criticism in the United States. Critics argue the deal will eliminate jobs in the U.S. The agreement, which includes 12 Pacific rim countries, is a critical economic component of Obama’s Asia policy. He has expressed confidence he can persuade the U.S. Congress to ratify the pact during a post-election session in the final months of his presidency. Without TPP, Obama’s strategy is significantly weakened, experts said. Opposition to the trade deal is fueling skepticism in Asia about America’s commitment to the re-balance, according to experts. 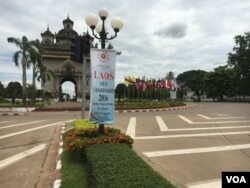 Flags of the 10-member ASEAN (Association of Southeast Asian Nations) and its dialogue partners are placed around the Patuxay Monument in downtown Vientiane, Laos, Sept. 5, 2016. On the streets of Vientiane, residents expressed tempered hope about the future, well after President Obama departs and the summits come to a close. “About Obama coming, a lot of people are happy. This is interesting for a lot of people,” said Sompaseuth Kounnavong, who runs a small grocery store near the site of the summits. Mek Boubong, who works in the tourism industry, was more optimistic. During his visit, Obama will hold a town hall with young people, make cultural stops and focus on U.S. efforts to help clear unexploded ordnance in Laos. About a third of the 2.2 million tons of bombs dropped on Laos by U.S. forces during a 9 year secret operation during the Vietnam war remain undetonated. The problem has slowed development in the country. Besides attending the summits, Obama will also meet with other regional leaders before departing on Thursday, marking the end of his eleventh and final trip to Asia as U.S. president.